This book, together with a complementary volume 'Religion in Consumer Society', focuses on religion, neoliberalism and consumer society; offering an overview of an emerging field of research in the study of contemporary religion. Claiming that we are entering a new phase of state-religion relations, the editors examine how this is historically anchored in modernity but affected by neoliberalization and globalization of society and social life. Seemingly distant developments, such as marketization and commoditization of religion as well as legalization and securitization of social conflicts, are transforming historical expressions of 'religion' and 'religiosity' yet these changes are seldom if ever understood as forming a coherent, structured and systemic ensemble. 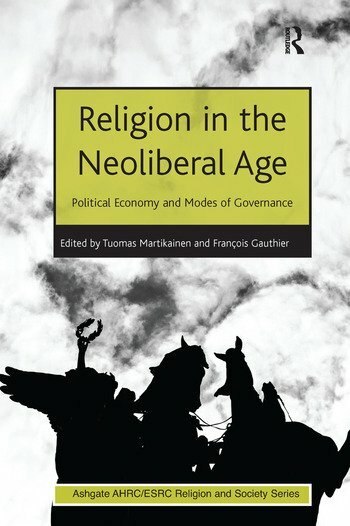 'Religion in the Neoliberal Age' includes an extensive introduction framing the research area, and linking it to existing scholarship, before looking at four key issues: 1. How changes in state structures have empowered new modes of religious activity in welfare production and the delivery of a range of state services; 2. How are religion-state relations transforming under the pressures of globalization and neoliberalism; 3. How historical churches and their administrations are undergoing change due to structural changes in society, and what new forms of religious body are emerging; 4. How have law and security become new areas for solving religious conflicts. Outlining changes in both the political-institutional and cultural spheres, the contributors offer an international overview of developments in different countries and state of the art representation of religion in the new global political economy. Contents: Preface; Introduction: religion in market society, FranÃ§ois Gauthier, Tuomas Martikainen and Linda Woodhead; Part I Religions in the New Political Economy: Entrepreneurial spirituality and ecumenical alterglobalism: two religious responses to global neoliberalism, Joanildo A. Burity; Making religion irrelevant: the ’resurgent religion’ narrative and the critique of neo-liberalism, James V. Spickard; The decline of the parishes and the rise of city churches: the German Evangelical Church in the age of neoliberalism, Jens Schlamelcher; Catholic Church civil society activism and the neoliberal government project of migrant integration in Ireland, Breda Gray; Faith, welfare, and the formation of the modern American Right, Jason Hackworth. Part II Political Governance of Religion: Neoliberalism and the privatization of welfare and religious organizations in the United States of America, David Ashley and Ryan Sandefer; Multilevel and pluricentric network governance of religion, Tuomas Martikainen; Regulating religion in a neoliberal context: the transformation of Estonia, Ringo Ringvee; Neoliberalism and counterterrorism laws: impact on Australian Muslim community organizations, Agnes Chong; From implicitly Christian to neoliberal: the moral foundations of Canadian law exposed by the case of prostitution, Rachel Chagnon and FranÃ§ois Gauthier; Religious freedom and neoliberalism: from harm to cost-benefit, Lori G. Beaman; Bibliography; Index. FranÃ§ois Gauthier is professor of religious studies at the Université du Québec Ã Montréal, Canada, and a specialist of religious formations in 'ultra modernity'. He has previous experience researching and writing on the rapports between religion, politics and economics in modern and contemporary society as well as on religion theory. He has experience editing volumes on these topics in both English and French, in reputed journals as well as in book form. His research interests are in the dynamics of religion with respect to the consumer ethos, electronic media and neoliberal policy. He edits the 'Religion, ethics and symbolism' section of the on-line Revue du MAUSS permanente (www.journaldumauss.net) and is part of the editing committee of the influential French social science journal Revue du MAUSS semestrielle. He has published widely in journals and books in both English and French, and is currently writing a book entitled Le mythe de l'autonomie. Religion, politique et économique en modernité (Paris: Desclée de Brouwer). Tuomas Martikainen is a docent and university researcher of comparative religion in the University of Helsinki, Finland. He is also member of executive general management team of the Post-Secular Culture and a Changing Religious Landscape in Finland Centre of Excellence in Ã…bo Akademi University, and a specialist of contemporary religious and ethnic diversity in Finland. He has previous experience researching and writing on religion and society and editing volumes on religion and immigration, including the textbooks and article compilations. Martikainen's research interest is in neoliberalism and new forms of minority governance in western societies, and he is currently editing Muslims at the Margins: Islam in Finland, Ireland and Portugal (forthcoming in 2012). He has also edited six books in the Finnish language and has published widely in English.